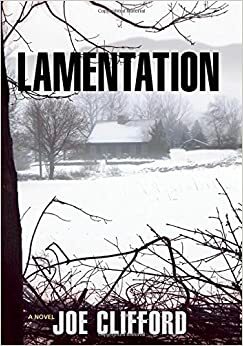 Lamentation by Joe Clifford is a noir book that takes place in New Hampshire. There is currently a big movement of Southern Noir in literature, but who doesn’t like a change of location once in a while? I received a copy of this book for a fair and honest review. This book came out in late 2014 and is well received by book reviewers everywhere so far. Things won’t change much here, because I also loved this book. Lamentation is told from the point of view of Jay. Jay is a smart guy who grow up in a small town in New Hampshire and is still there. He works for Tom who does estate sales. He basically moves things from the house of the dead and decides what is trash and what Tom can sell at flea markets and such. It is the middle of the winter and Tom doesn’t have any work for Jay and lays him off until things pick up. Jay has an ex-girlfriend, who he is still in love with, and they have a child together. Jay also has a brother, Chris, who in my opinion is the most interesting character of the book. Chris is also a thorn in Jay’s side. Chris is a homeless drug addict who is full of paranoid conspiracy theories. When Chris is wanted for questioning in the murder of his business partner, it is in everybody’s best interest if Jay finds him before somebody else does. As Jay knows Chris is not capable of murder, he recruits his best friend and an old high school classmate that is now an investigator for an insurance company, to help him with his own investigation. The book gets more interesting as Jay looks into the murder and how Chris is involved. Small town rumors boil to the surface and Jay learns more about his brother and his town as he goes. I loved this book! It is well written and has a story with multiple threads of interest that I could not read fast enough to see what it all meant. This does delve into some pretty dark themes and is immensely entertaining. If you are a fan of noir, mystery or crime fiction it is a book I believe you will enjoy. I look forward to reading more books like this from Clifford and wish him a long and lustrous career.